Leonor Orosa Goquingco(1917-2005), a pioneer choreographer of the Philippines. After studied at Columbia University and Teachers College in New York City, she studied ballet at the Ballet Russe de Monte Carlo. Returned to Philippines, she helped establish the Philippine Ballet Theater and founded the Philippines cas Dance Company. 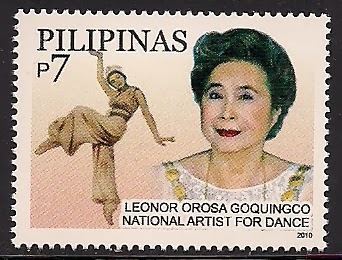 She was given the National Artist Award in 1976.